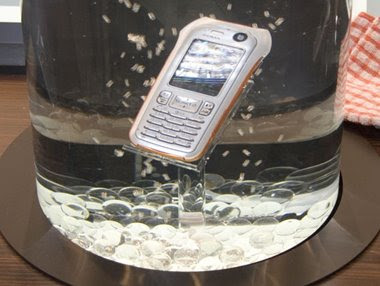 If you are able to quickly remove the phone from the water, then you’re likely to be able to restore it. Most phones have a tight, sealed outside layer that will help keep out water for a short period of time. The key is avoiding contact between the water and the phones electronic components while they are powered by the cell phones battery. You should quickly work to get rid of the excess water by draining the phone and then using a towel to clean off external moisture. Resist the temptation to use a hair dryer on the internal components, as this may cause damage to the circuitry, even at a low temperature. Instead, you need to use a suction source such as a vacuum, but be careful to keep it out of direct contact, otherwise static electricity might come into play. Once you have removed the water that you can directly, you should use a dessicate to absorb water on the phone. After you have following the aforementioned steps, allow the phone to dry naturally dry. After 24 hours you should test its operation. If it’s still not working, you should visit your cellular carrier store to see if they can help replace or restore the phone.